Baby Boomers and the Silent Generation can help drive health club member growth and, ultimately, profits. Our research expert explains. In the United States, health clubs serve more than 60 million members and another 9 million non-members. 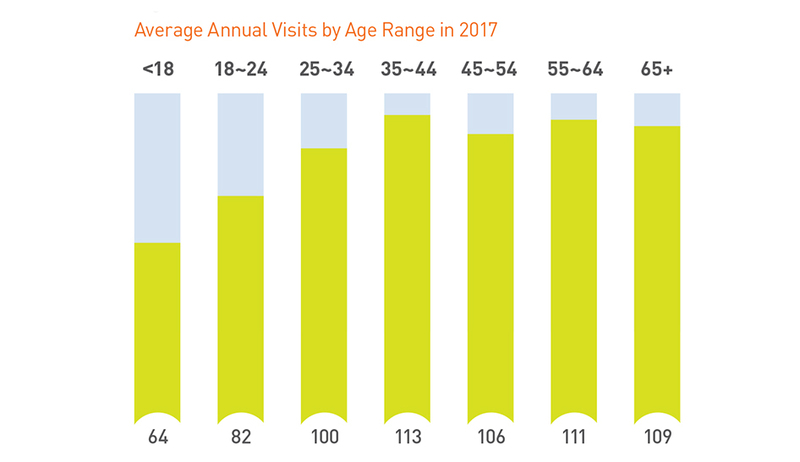 Although there are fitness and health outlets for just about any niche, health clubs, gyms, and studios tend to be the playground for the young as more than 75% of health club members are under the age of 55. Less than one out of four health club members come from the Baby Boomer and Silent generations. According to the U.S. Census, Baby Boomers and Silents make up 28% of the population. While this percentage will decrease over the next two decades, they will remain a large segment of the population over the next several years. Along with their unique fitness needs and active aging goals, older generational groups are fertile ground for the industry. The IHRSA Health Club Consumer Report shows the opportunities to attract and engage Boomers and Silents have significant profit and growth implications for club owners and managers. Delving into the report, we can examine three key characteristics of Boomers and Silents that can help drive club member growth and, ultimately, profits. Unlike their younger counterparts, Baby Boomers are more likely to remain members over the long-haul. For members between the ages of 55-64, the average member tenure is 7.1 years, for those over the age of 65, the average tenure is 7.3 years. The average member tenure for the 55+ group is roughly two years longer than Generation X (5.2 years) and more than three years longer than Millennials (3.8 years). Furthermore, Baby Boomers are more likely than any other generation to remain a member for at least 10 years. Think about what another two or three years’ worth of member dues would have on your bottom line. Is your club in a position to target and serve Baby Boomers? If so, appealing to Boomers may help your club extend the average tenure of your members, meaning ongoing member dues revenue for months, if not years, to come. In 2017, members used a fitness facility for an average of 98 visits. Members between the ages of 55 and 64 used a health club 111 times, while those ages 65 and older used a club 109 times. As the industry axiom goes, frequent health club attendance is positively correlated with increased spending on club goods and services. Engaging and incentivizing frequent attendance across your market of Boomers and Silents can add to your bottom line with as they are highly likely to spend on non-dues related services such as training and sports-specific instruction. 3. Baby Boomers & Silents Are the Wealthiest Generations in the U.S. According to one Deloitte study, Boomers and Silents hold nearly 80% of the wealth in the U.S. and will continue to be the wealthiest generation until 2030. Over the next decade, Boomers and Silents represent the largest reservoir of wealth and disposable income in the U.S. Considering the importance maintaining health and wellness holds as a top priority, Boomers and Silents are in a prime position to invest in their well-being. Club operators can serve the needs of their Boomer and Silent members by offering club activities and programs of interest. 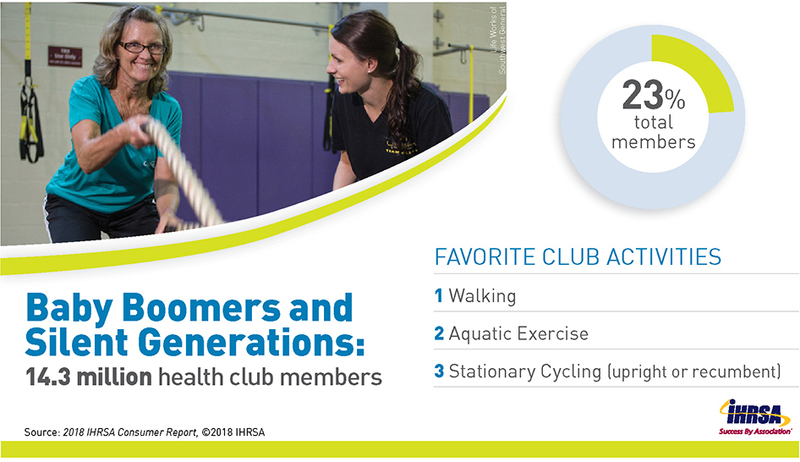 IHRSA’s Health Club Consumer Report shows that the top three club activities among the Baby Boomer and Silent generations are aquatic exercise, stair-climbing, and walking. Flexibility training and Tai Chi also rank high with the 55+ group. Overall, Baby Boomers and Silents are primed and ready to drive immediate growth in health and fitness facility membership and revenues. They form an underserved market with potential, considering their loyalty (evident by long member tenure), frequent attendance, and disposable income. Serving this generation may be a short-term play compared to attracting younger generations, but, as they say, there are riches in niches.